Those chess pieces are come in giant size. A giant chess set that has made from Teak wood anda carved carefully by expert craftsman from Java island. Unique and beautiful chess for outdoor game. Usually used for chess festival and other outdoor game. All ages like this chess for play together or having outdoor chess game. It very interesting to play chess game outdoor with your friends, children and family member. By using this giant chess, you can enjoy your chess at garden, backyard, camp area, beach and another interesting object. Those are easy to move even in giant size. You just need a flat chess board and the game can start. 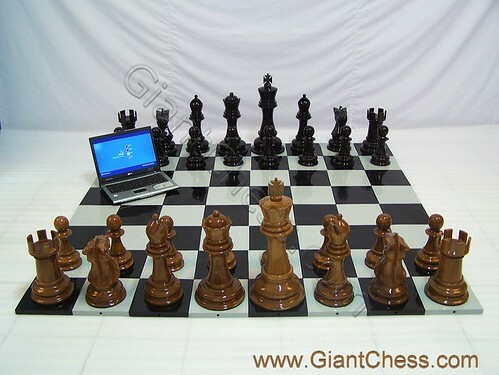 To complete your outdoor game, we provide a wooden chess board for your giant chess pieces. Made from Teak wood and polished well in black and white squares. Get it now and enjoy your outdoor game using giant chess and wide board.